Every child deserves family, community, a childhood, and the supports they need to grow up healthy and happy. Fair, humane and just treatment of children and youth in foster care and the juvenile justice system requires advocacy that goes beyond ending harmful practice and dangerous conditions. While Youth Law Center uses a wide and creative range of strategies to achieve system change, including litigation, policy reform, public education, technical assistance and collaboration; advocacy is at the heart of our work. Always takes the side of the child, even when controversial. Is based on critical principles of human development, and recognizes that each child is unique and requires a unique approach. Focuses on the inherent health and potential of children. Involves actively listening to all participants in the system. Understands local communities must lead in transformation of their systems. Is relentless, persistent and willing to do whatever is necessary to seek solutions. Is creative, flexible, strategic and solution based. ISSUE: The Youth Law Center has led the charge across the country for decades to end use of institutional care as an acceptable place for children in the foster care and juvenile justice systems. One of our basic values holds that children are best served in their home communities where family support is easier; connection to a broader range of services is possible; and disruption is less pronounced than in institutional settings..We have successfully reduced the number of children who are incarcerated, in group care, or otherwise removed from their homes and communities, when they can be appropriately served in less restrictive settings. WHY IT’S IMPORTANT: Developmental research shows that institutional care interferes with child and youth development. the important development tasks of children and youth of all ages. The creation and maintenance of stable attachments to parental figures is crucial not only for young children, but also for older children and adolescents. Detention and group care facilities are fundamentally ill-equipped to provide for the developmental needs of young people. Young people need committed families to successfully transition to adulthood as resilient, happy community members. HOW YLC IS MAKING AN IMPACT: YLC has achieved victories in eliminating incarceration and institutionalization of children and youth through litigation, legislation, ground-level policy advocacy, media advocacy, organizing internationally respected developmental and brain science researchers on the issues and researching and publishing with them to bring information to policy makers and the field across the country. Our work assures that children have access to community-based services that allow them to live in their families and communities and staff have become experts on use of public funding streams as a way to assure that such services are available. See our Resource Library for more information on this topic. ISSUE: With more than four decades of experience in institutional litigation, involvement in developing facility standards, and responding to conditions questions and complaints, Youth Law Center staff are national experts on juvenile conditions of confinement law and humane conditions in both foster care and juvenile justice. YLC receives and responds to requests for assistance on specific conditions, and works to improve the care and treatment of children in system custody using a range of strategies. WHY IT’S IMPORTANT: A myriad of federal, state and local laws, policies and regulations impose standards that are designed to protect youth and govern the care that is provided while they are in out-of-home placement. Youth have specific rights to be protected from harm in care and systems have a fundamental obligation to treat children fairly and humanely. HOW YLC IS MAKING AN IMPACT: YLC’s advocacy has stopped children from being subjected to illegal or inhumane conditions in juvenile detention and foster care facilities such as use of solitary confinement, improper use of restraints , pepper spray or searches, physical and sexual abuse of children as well as failure to provide family contact, medical care, mental health, education and special education services. Whether developing or revising juvenile facility or licensing standards and regulations around the country, assisting agencies in quality oversight and improvement, acting on complaints about conditions, or providing training and technical assistance to staff, advocates, judges and attorneys, YLC does what is necessary to ensure children are treated humanely. ISSUE: The Youth Law Center has been a leader in raising awareness on the causes of, and harm to, youth being funneled into the juvenile justice system. When police enforce rules and manage child behavior in foster care instead of offering the understanding and support of a normal parenting situation, catastrophic harm results. WHY IT’S IMPORTANT: In foster care, childhood is sometimes criminalized. Channeling vulnerable children into the juvenile justice system disrupts their schooling, impedes healthy development, and heightens the risk of poor long-term education, employment, and health outcomes. Unless youth commit serious or violent offenses, they should remain in foster care and receive supports from their families and communities. HOW YLC IS MAKING AN IMPACT: The YLC’s advocacy has focused on ensuring foster youth are not criminalized for being adolescents, and addresses condition at specific facilities. By supporting legislation like AB2605, we continue to fight for policy reform to require data collection on use of law enforcement in shelters and other group care facilities, and to protect children and youth in foster care from being needlessly detained in juvenile hall due to their foster care status. ISSUE: The Youth Law Center addresses the harmful practice of handling children in the adult court system. Adult court handling flies in the face of our fundamental belief that children and the community are better served when children receive habilitative services and support that enable them to move successfully forward in their lives. Our work has helped keep hundreds of youth from being sentenced to adult jails, and has enabled youth to receive reviews of harsh sentencing after serving time in good standing. WHY IT’S IMPORTANT: Developmental and neurological research clearly states that children are not capable of making reasoned decisions. Unfortunately, this realization has come too late for many children sentenced to long prison terms in adult facilities. And because adult court is premised on the idea of punishment and imprisonment, the court handling also interposes barriers to providing services and support that would enable young people to move successfully forward in their lives. HOW YLC IS MAKING AN IMPACT: The YLC is working to undo the harm for these children by assisting them in using legal remedies to obtain the chance for release, and the opportunity for the new beginning in their community they deserve. ISSUE: The Youth Law Center has advocated to ensure public agencies enforce and adhere to rules regarding conditions within various systems. WHY IT’S IMPORTANT: Public agencies hold ultimate responsibility for ensuring the well-being of the children and youth in a system. While the YLC believes public agencies can and should strive for excellence in meeting this critical obligation, we must sometimes hold public agencies accountable for complying with their own rules and standards. HOW YLC IS MAKING AN IMPACT: The YLC has engaged in litigation, policy reform and general advocacy requiring public agencies to enforce and adhere to rules regarding conditions for group care (including shelters), conditions in detention facilities, adequately supervising children in out of home care and providing supports for children in the juvenile justice and child welfare system. In many cases, the YLC’s long standing trusting relationships with agency leaders developed through advocacy efforts allow for informal settlement and solutions. ISSUE: Driven by the belief that every child deserves quality parenting, the Youth Law Center developed and implemented the Quality Parenting Initiative (QPI). QPI is an approach to strengthening foster care, refocusing on excellent parenting for all children in the child welfare system. WHY IT’S IMPORTANT: In order to thrive, all children and youth need excellent parenting. Child development and trauma research indicates that children need constant, consistent, effective parenting to grow and reach their full potential. Learn more about QPI. HOW YLC IS MAKING AN IMPACT: QPI is creating a movement to transform foster care through a network of families, youth, agency leaders, judicial leaders, agency staff, and community organizations committed to developing and sharing results-based solutions, advocating for and implementing policy and practice changes, and changing the culture of child welfare to focus on the QPI goal of excellent parenting for every child and youth in care. The commitment of local and state leaders, philanthropy and the community has moved the field to address some of the most serious adversity identified by children in the system. 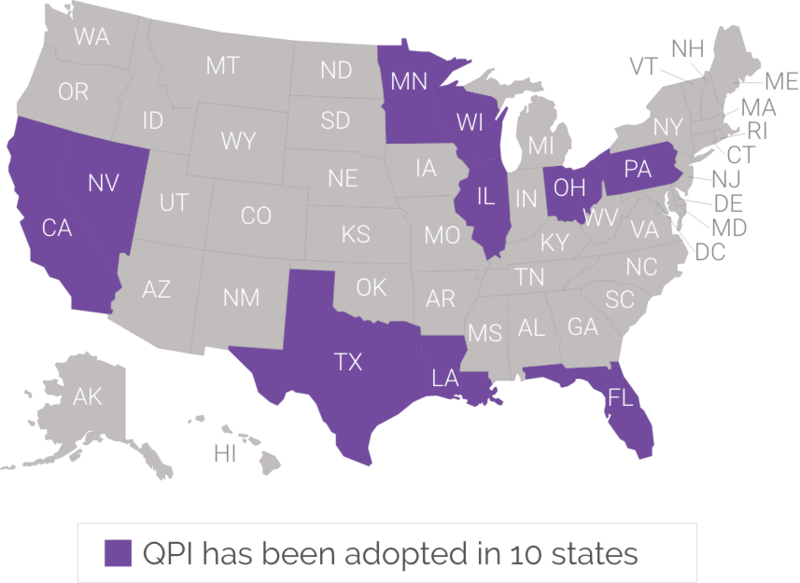 Initially adopted by three pilot sites in 2008, QPI now has a presence in 10 states and 70 sites across the country. It is the statewide approach in four of the states. See our Resource Library for more information on this topic, or visit the QPI site to learn more. ISSUE: The Youth Law Center is leading efforts across the country to remove practice and policy barriers that impede coordination between birth and foster families (including relatives and kin caregivers), so foster parents can support healthy families. WHY IT’S IMPORTANT: Birth and foster families know children and youth best and are most invested in their healthy development and happiness, but have historically been separated and currently face many system-induced barriers to coordination and partnership. HOW YLC IS MAKING AN IMPACT: The YLC is uniting birth and foster families to create and implement shared policy and practice solutions, educate policymakers, leaders and staff, and develop model programs. Relying on research from the University of Delaware, YLC has developed model programs that support attachment to both families and provide children with the consistency they need. ISSUE: The Youth Law Center has been a leader in ensuring the special and unique developmental needs of infants and toddlers are met by child welfare leaders. In our group care work, the YLC has been particularly successful in limiting the use for children under age six. WHY IT’S IMPORTANT: While the importance of this period of development has been widely recognized for some time, child welfare policy and practice often contradicts what we know babies need. HOW YLC IS MAKING AN IMPACT: The YLC’s strategies have included: 1) policy reform, 2) litigation, 3) development and dissemination of developmental resources to advocates, partner agencies, and families, 4) Training for child welfare professionals and policymakers by nationally regarded researchers, and 5) collaborative work with child welfare agencies, families and stakeholders to develop and implement model practices and policies. ISSUE: One of our systems’ most important responsibilities and most impactful interventions is the support and encouragement of parenting youth. Incarcerated teen parents, particularly fathers, are an often ignored and overlooked population, who often face institutional facility barriers to visiting and maintaining a relationship with their child. This was the motivation for creating Just Beginning. Learn more about Just Beginning. WHY IT’S IMPORTANT: Research has shown the consequences of not supporting the relationship between incarcerated youth and their children, both for young children who are deprived of a nurturing relationship with their parent, as well as youth who are deprived of one of the most important motivating relationships and protections against recidivism. HOW YLC IS MAKING AN IMPACT: The Youth Law Center has developed and implemented Just Beginning, a parenting program in partnership with Georgetown University for incarcerated teens that incorporates research from successful attachment approaches to parenting. Just Beginning is showing to be impactful in improving relationships between parents and children, supporting a smoother re-entry process and changing the culture inside detention facilities. ISSUE: Education is critical to reducing recidivism and ensuring that youth involved with the the juvenile justice system are able to succeed. However, the juvenile justice system does not always provide adequate educational supports of access to higher education. Juvenile justice and education systems have focused on preventing negative outcomes rather than adopting policies and practices that support youth’s academic potential. WHY IT’S IMPORTANT: Time spent under Juvenile Justice supervision provides an opportunity for youth to make educational gains. Juvenile court involvement can be the first stop on the path to school success rather than the next stop on the pipeline to prison. HOW YLC IS MAKING AN IMPACT: The Youth Law Center incorporates research from behavioral economics to remove disincentives for continuing education and to develop the supports, partnerships and policy framework needed to interrupt the inter generational cycle of poverty by improving access to education for current and formerly incarcerated youth. ISSUE: The Youth Law Center’s advocacy relies on the informed and strong voice of youth to educate others about the problems that are most critical to them, and to offer solutions they feel will have the most impact on their lives. WHY IT’S IMPORTANT: YLC believes that systemic advocacy must be informed by, guided by, and carried out in partnership with those most impacted in order to be effective and sustainable. The priority areas we focus on, the solutions we advocate for and the strategies we select are directly influenced by youth who are closest to the problems. Our effectiveness in achieving our mission is dependent on expanding opportunities for youth with diverse experiences and perspectives to share the issues that matter to them, their ideas for change and to be partners in system transformation. HOW YLC IS MAKING AN IMPACT: One of YLC’s key commitments is supporting organizational and individual development that builds capacity for youth leadership and advocacy. YLC partners with youth to bring their voice to systems change, and when helpful, provides training, technical assistance and strategy and policy support to youth advocacy organizations. ISSUE: The Youth Law Center works to ensure that youth leaving either the child welfare or the juvenile justice system have needed supports including housing, financial supports, parenting, and mental health and medical care. WHY IT’S IMPORTANT: Transition aged youth in the juvenile justice and child welfare systems face the prospect of losing financial support and health insurance at age 18 before they have the ability to provide for themselves. HOW YLC IS MAKING AN IMPACT: The YLC works to extend foster care to age 21 and ensure youth remain on Medicaid through their 26th birthday. Staff advocate for increased access to education, improved transition planning policy and practice, and address barriers to normal adolescent developmental experiences, and ensure equal access to benefits for youth in both systems.